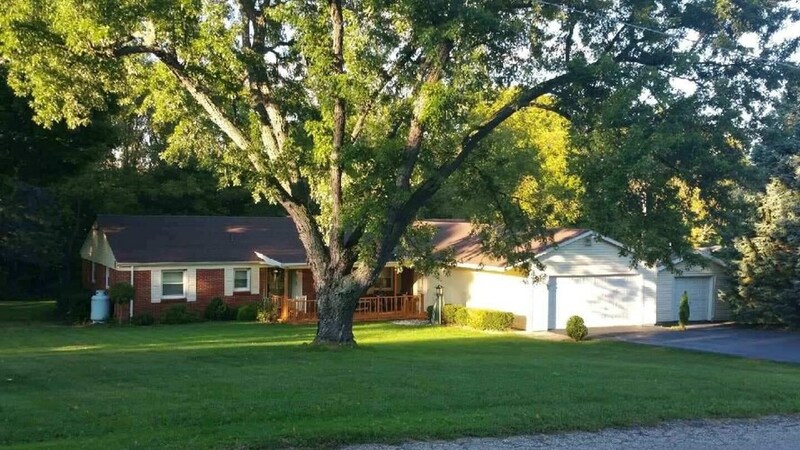 Ranch home with 3 bedroom and a den, 2.5 baths. This home has plenty of room to entertain with the add on additions. Original brick home was built in 1956, since then new master suite, family room, recreational room (housing a 7'x14'x4' swim spa) 3 season room, newer two car garage and additional detached garage have been added as well as many upgrades. Hickory cabinets in the kitchen were put in with the remodel. Most all of the windows have been replaced as well, New Central AC added is a plus for those hot sunny days. Cedar closets, built ins in two of the bedrooms. Two Master Suites. Gentle slope with lots of mature trees, fenced in back yard. Two newer motors installed in swim spa. Refrigerator in the kitchen is not included in the sale. Sellers are offering a one year AHS Home Warranty. Directions:S Wayne south to 150 S, east to home.